At times I change direction when I make a plan, now I know why most people avoid plans, but I am a planner by nature. A good plan gets me off in the right direction even if I do decide to take a short side trip, eventually I get back on course. My quest was to complete a skirt, a bag and a dress, I have completed 2 of my 3 quests so far, but I am finding that getting to the dress is less inspiring, even though I have a great Simplicity summer dress pattern that I gained at the Pattern Review Weekend pattern swap in NYC. 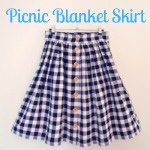 However, my sewing genie is saying make another skirt, especially the Tilly and the Buttons inspired Picnic Blanket Skirt. The dilemma is, I have some wonderful grayish blue stripe seersucker I planned to use for the dress, now I want to use the fabric for the skirt, ahhh decisions. Something tells me there will be some fabric shopping in the near future, because this fabric is begging to be a skirt.